This year for the first time we are bringing together two popular organic events to allow more people to participate in both. The Soil Association’s National Soil Symposium (25th November) will be focusing on resilience. The ORC conference has producer-focused technical and business workshops on the first day (26th November), and a more specific focus on current research and innovation activities on the second day (27th November), with the aim of bringing producers, researchers, advisers and students together to make change happen! The Producer Conference and National Soil Symposium are both supported by the Rural Development Programme for England (RDPE). For the Producer Conference eligible participants can claim £20+VAT off the day rate, to be refunded later. 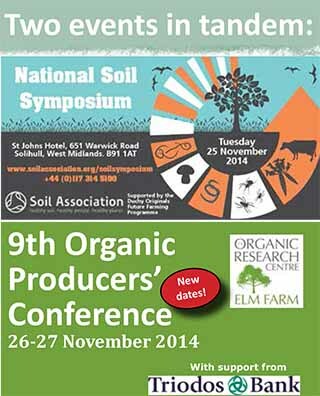 For the Symposium the Soil Association have a limited number of tickets available at a reduced rate of £48+vat. Eligible participants includes producers and employees of producer groups, supply chain businesses, direct retailers, but not multiple retailers, government departments, agencies or public bodies including universities. Participants must be living/working in England. We have funds from various sources, including the Organic Growers Alliance and the Ernest Cook Trust, to enable young people (students/apprentices/new entrants) with limited means to attend the conference. We have also secured bursaries for young people living in Berkshire. If you are 26 or under, resident in Berkshire and training (student/apprentice) to or starting a career in agriculture, you may qualify for one of our Gordon Palmer Memorial Trust bursaries. Bursary funding is also available from the Greenham Common Trust for young people (aged 18-26) from West Berkshire who are registered on an existing FE/HE course in agriculture, horticulture or related topic, or engaged in a relevant work-experience placement or apprenticeship scheme, or at an early stage of a career in a food or farming related business. If you think you may qualify, for any of the above bursaries please e-mail Gillian Woodward with details of your address, age and circumstances to check eligibility. We have an informal poster session between 18.00 and 19:00 on the 26th November. If you would like to bring one with you, please contact Sally Howlett with details. You can find proceedings of previous conferences .